Ash Wednesday begins on March 6, 2019 and for millions of people around the world, this means something- action. 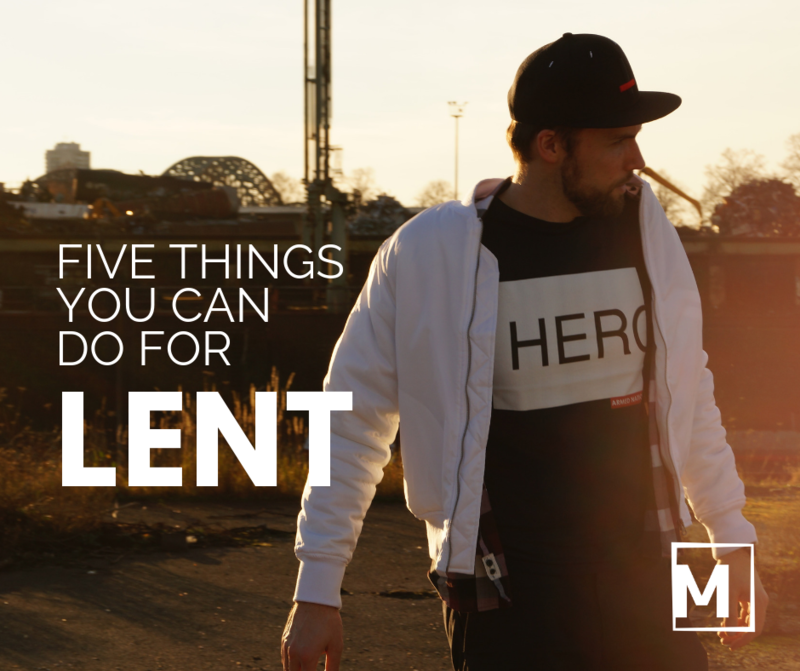 All of us want to put our faith into action and Lent is the perfect time to do this. I figured it would be interesting to connect five actions you can take during Lent to my upcoming book, The Five Habits of Prayerful People. I wrote The Five Habits in order to provide a virtual toolbox of strategies for prayer. It’s designed for the busy person in mind. Before we link the book with Lenten action, let’s remind ourselves why Lent matters in the first place. Lent comes from an old word meaning “lengthen”- as the days get longer, the sunlight returns and we inch ever closer to Easter. Since Easter is all about Jesus triumph over the cross through his resurrection, Christians have, for thousands of years, practiced a sort of “retreat” during Lent. This looks like, not surprisingly, a series of actions designed to help us get ready for Easter. If you “do Lent right”, you’re more likely to enter into the deeper mysteries of the season and as a result, draw closer to Jesus. As Pope Francis said, “Lent is a fitting time for self-denial; we would do well to ask ourselves what we can give up in order to help and enrich others by our own poverty. Let us not forget that real poverty hurts: no self-denial is real without this dimension of penance. I distrust a charity that costs nothing and does not hurt." The problem of course is that we get distracted, tired or bored during Lent. The things we resolve to give up can become a distant memory if we’re not laser-focused on the task at hand. Habit of Passion and Pursuit >> Begin to enjoy five minutes of pure silence each day. Start with one minute each day for a week. Each week, add a minute to your silence. Invite God into the stillness. Habit of Presence >> Look people in the eye. When you are in public and in passing or when you are one-on-one with someone… work to give them your full attention. Habit of Preparation and Planning >> Choose the tools you’ll use during your morning quiet time. This will likely be a Bible and journal. Besides that, what else speaks to you? An icon? A crucifix? Identify and group the tools you’ll use. Place them somewhere that you’ll have your daily quiet time. Habit of Persistence and Perseverance>> Install a quote that inspires you in a place you’ll see it. This might be a quote from a saint or a Bible quote. Put the quote inside your journal or Bible. Or, have the quote framed and placed in a spot where you’ll see it often. Habit of Pondering>> Take one day off from technology each week. This is the single most powerful strategy I’ve used in the last five years. Step back from your phone and give God one day a week to break through the noise of digital stimulation. These strategies really work. More significantly, they matter a whole lot. They contribute to a more prayerful life and collectively will help you to slow down. When we slow down, we are more present and it’s much easier to find God in everyday life. FOMO, or the “fear of missing out” is more pervasive than we’d like to admit. While the internet certainly enhances our vulnerability to FOMO, I can remember being in college and wondering what others were doing on a Friday night. What if, my thinking went, other students are doing something more fun than what I am doing? I was left with a feeling of not only being left out but maybe that I wasn't as valuable as others. Social media makes FOMO more of a reality than ever before and you might not be aware of its effects on your psyche. If you're consuming large amounts of social media, it may be impacting you more than you realize. It didn’t go so well. The students struggled mightily during the week to stay off Facebook and Snapchat. They actually felt as if they were missing out on life while staying off the internet. This NPR piece explored the effect of too much Facebook on a young woman’s desire to be happy. She explained that Facebook allowed her to post the good and the beautiful and avoid the ugly aspects of life. The result of Rachel’s savvy use of social media revealed an awareness of its inherent bias towards posting only what’s good. Beyond that, she realized that she didn’t want to be posting everything for the world to see. Sure, life is good when it’s good but sometimes things can go south, like when Rachel’s marriage fell apart. She didn't feel like posting much of that aspect of her life. FOMO increases anxiety. We feel somehow “less” than the others we see online, especially if what they're posting looks exciting. The good news? It doesn’t have to be that way. First, from a posture of how you use social media. I suggest using it in the way that you want it. There are no set rules to how often you should post to Facebook. If you feel like posting, go for it but never feel pressure to stay up to speed each and every day. Related to this, if you feel like social media has been getting the best of you, take permission to ditch it altogether. Why Is It So Hard to Work ... at Work? Working at work is hard. The distractions, interruptions, poor lighting, climate control, and constant meeting schedule make it hard to work when you're at work. a) Fix what you can of your current working environment. b) Find another situation that allows you to work remotely, even if it's only for a portion of your week. Which can you choose? Which will you have the courage to choose? This is a guest post by Hank Geng from Min-Max Your Life. Hank writes about productivity and organization, helping readers overcome overwhelm and procrastination. When was the last time you looked at your phone? Checked your email? 10 minutes ago? Less? In this day and age, we’re addicted to our screens, and we get barraged from every direction. So many things demand our time, and in the process of managing it all, it’s easy to lose sight of what really matters to you. It’s incredibly helpful to make a habit of unplugging on a daily basis so you can stop this constant flow of information and have a chance to recharge. This works best in the context of an evening routine that prepares you for the next day, allows you to reflect on what you are grateful for, puts you in a relaxed mood, and lets you get a good night’s sleep to wake up refreshed and energized. What made this day unique? Rest by turning off your lights, drawing the curtains, and going to sleep. People require different amounts of sleep, but start with allotting yourself 8 hours for sleep and go from there. By creating your own evening routine that includes these four factors, you’ll start waking up the next morning refreshed and energized, ready to face the day. If not, try reserving an hour before your bedtime tonight to try creating your own using the framework above. I admit it- if it's new, shiny and requires a power cord, I'm interested. If Apple makes it, I'm looking for my wallet. And then something serious happened about a month ago: we ran out of data. This was cause enough for a Family Meeting, which of course the kids hate. Bear in mind that not ten years ago, this concept (losing data) would have made no sense at all but in 2016, data is a big deal. We see data as a right, an entitlement and a part of everyday life. I was traveling for work that month and needed to use a lot of data and returned with two weeks left in our billing cycle with (gasp!) very little data to spare. Since we have a family shared-data plan, this became a family problem. We shut down almost everything that would consume data and by the end of the month, just made it with .07GB to spare. Phew! But you know what? Those two weeks with basically zero data taught me a few things. First, I learned that most of the stuff I do on my phone is kind of lame and going without it was no big deal. So I can't check Facebook? Ok. So I can't see Instagram updates when I'm at the grocery store? No big deal. And, even better, I learned to daydream. I learned to be bored again. To stare out the window and watch stuff. It was nice. As it turns out, my not-so-smartphone without data taught me a great deal. It made it easier for me to unplug and just be with my family and friends. It taught my kids the value of margin and open space. One final thing: it taught me that Facebook and Instagram aren't nearly as interesting as I had previously thought. Here's to the simple things in life... With or without data. Tim Metz is my special guest for Episode 14 of the Emergent Leader Podcast. Tim is the founder and CEO of Saent Productivity. Saent (pronounced "saint") is a company dedicated to helping you focus while you are at work. Their new product, "The Saent" is pretty cool- a unique marriage of software and hardware. Tim and I talk about his journey from fatigue to focus. Assisted by his discovery of Getting Things Done, Tim found that by doing one thing at a time, his productivity increased exponentially. Sign up with your email address to receive my free eBook and weekly updates. Thank you! An email will arrive shortly with your free eBook and further instructions.